Second part of the tutorial on PokerAceHud on the advanced features of the software. 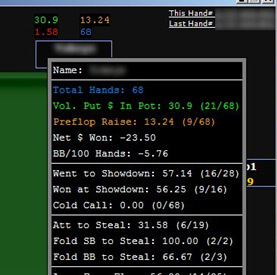 Hands used for average: Used only to identify the table average pot size. The n option has no effect on other statistics. To determine the average pot size, PAH will look X last pots from the table to the average. Invalid Stat Text: For example, if you ask PAH d display the number of continuation bets d a player s it n never had the opportunity to make bets continuations, the value shown instead of statistics will be X. The default value is "N/A". I suggest d use "-" because it takes less space than "N/A" and c is less bulky/distracting on the tables. Minimize to System Tray: There will be no PAH bar in the Windows task bar. This option is very useful if you have lots of open d windows and allows you to de-clutter your Windows task bar. When you want to open the software, click the icon that will be next to the time. Enable Pop Up Stats: If you place that some statistics on the table, you can use a pop up to see additional statistics. The pop up will be available when you click on the box player in the poker software (box in which the user name is specified, or even the first image below). Check for Updates: Checks for new versions in the launch of the software there. Enable Logging: Do not use this option, unless requested by the support of PAH. Tables Averages on List: The list is the main window of PAH (see the second image below). Simply specify the columns you want to see on this list. All these statistics are also viewable on the tables, but this list allows you to see the statistics of all your open tables on the same list instead of move from table to table to try to determine the less profitable table for example. 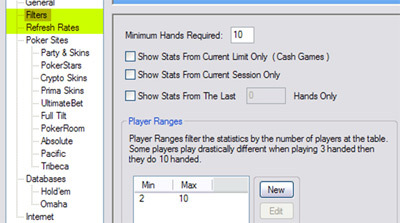 Minimum Hands required: Players with fewer than X hands n will not have their statistics displayed. Show Stats From Current Limit Only: If you try statistics $ and $6–88 for a player and that you're currently playing the NL50$, try statistics $ will be ignored. Show Stats From Current Session Only: If you've played with one player in the past, only its statistics from the current session will be taken into account by PAH. Show Stats From the Last X Hands only: If you have lots of hands on a player, you can instruct PAH not to take into account only the X last hands. This option is especially useful if you have many thousands of hands on some players you've seen over a period of several months. Their style of play has surely changed with time and their first hands could distort their statistics. N using only the last X hands of players, you set the problem. Player Ranges: This n option is not really useful if you play always on full rings tables or tables still 6 players. Obviously, if you constantly play on the 2 types of tables, you will have a very different style of games on each type like the other players. If you have statistics tables to 6 players on a player and you apply them to the same player on a table with 10 players, you may d have surprises. 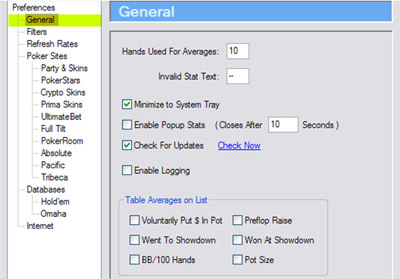 This option allows you to exclude statistics full ring tables to 6 players, and vice versa. For example, if you're sitting in a 6 player table and you use the following ranges, all hands that the other players will have played on tables to more than 6 players (7 to 10 players) will be ignored. Inverted l, if you play on a table with 8 players, statistics of all hands having been played when there were only 2 to 6 players will be ignored. Refresh Rates (next tab in the left menu): Whenever PAH will consult statistics of PT, it takes resources and time. And, as each statistic is an average, a hand more for a player you have 10000 hands no statistics will radically change! On the other hand, if you have that 30 hands on a player, s he raises preflop hands d sharpened, its statistics will change greatly. The idea is therefore to specify a frequent refresh rate for players with little hand; each of their hands being likely have a big impact on its statistics. Inverted l, use a slow rate of refreshment for players with a lot of hand, as each of the hands will not change the statistics in a very small way. This allows you to not hog your system resources. The defaults are reasonable. Personally I use 6 for all players, and I n have no performance problem when I play on tables 9 to 6 players on my computer which dates from 2002. Using «6» for all players, statistics of the players will then be updated once per orbit, which is more than enough, even for players with few hands. This is! PokerAceHud is now completely configured. You can l use on your sites favorite with models ("layouts") by default. In the next article on PAH, I will cover the "layout manager" in detail. Later, in a subsequent article I will describe how to create good models that meet your needs without requiring the use of pop up, while being easy to understand and read. If you have any questions on this item or PokerAceHud, n feel free to post them on the forum.